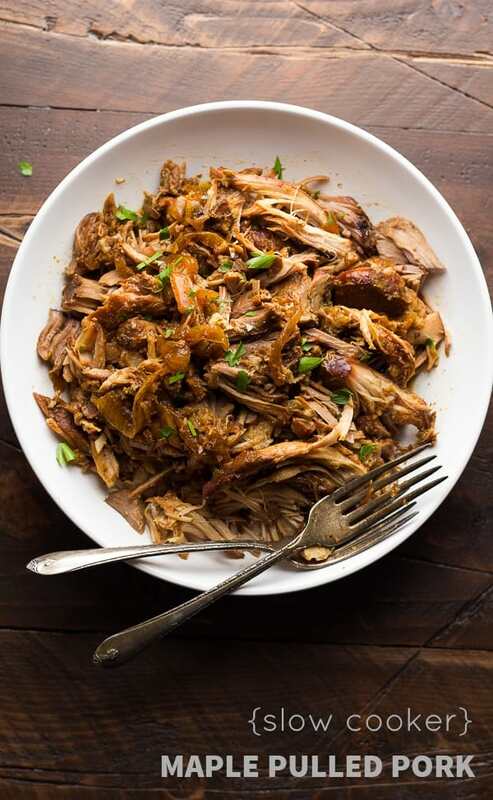 Only 6 ingredients and 10 minutes are needed to prep this maple pulled pork recipe! After 8 hours on low, this pork is so tender and wonderfully sweet and savory from the maple syrup. Wow, how is it already time for September’s 3-in-1 slow cooker recipe!? It feels like it was just yesterday that I posted my Slow Cooker Honey-Lime Chicken recipe and three recipes to use it in. 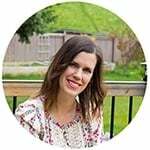 In case you are new around these parts, I am doing a fun slow cooker series to help us all with those large-batch slow cooker recipes. My family of three can rarely finish a large batch of food from the slow cooker, and we are always looking for new ways to use it. My solution: provide you all with one base slow cooker recipe, then three delicious meals to use it in! This week: pulled pork! 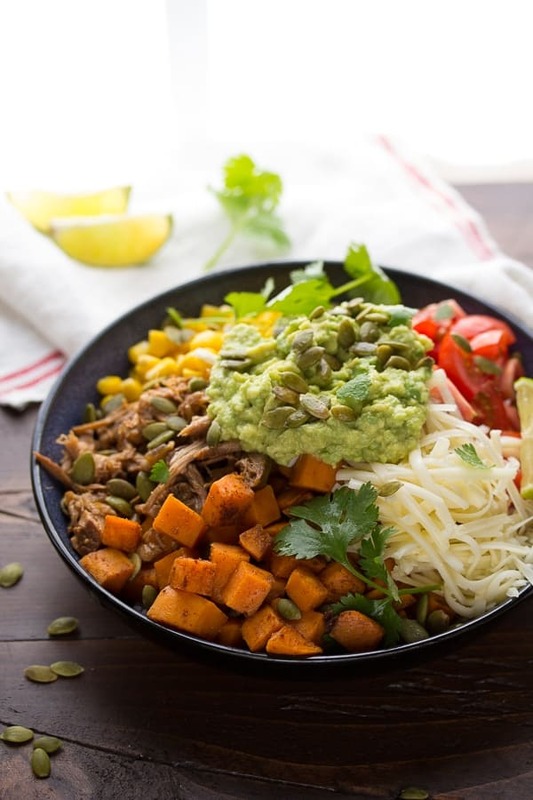 Today I will be sharing my base slow cooker recipe for Maple Pulled-Pork, and stay tuned for the rest of the recipes this week: Maple Pulled Pork Enchiladas with Butternut Squash, Maple Pulled Pork Tacos with Kale Slaw, and Pulled Pork Burrito Bowls with Sweet Potatoes and Pepitas. Now, I’m going to admit that I’m a strange person who doesn’t normally like pulled pork. It’s always too…saucy. At least that’s the only thing I can pin point. The last time I ordered a pulled-pork sandwich at a restaurant, I couldn’t finish it. There was just so much sauce and it was too much of something. Maybe BBQ sauce? I couldn’t put my finger on it, but I was in no rush to eat pulled pork again anytime soon. 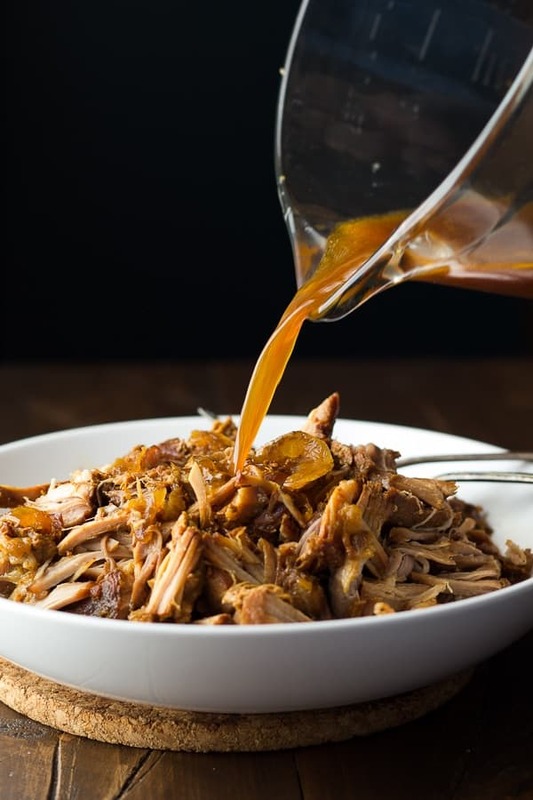 But this maple pulled pork recipe has changed my mind. It isn’t saucy, but it is juicy, moist, and full of flavor! The flavor comes from a few simple ingredients: maple syrup for sweetness, apple cider vinegar for some tanginess, chili powder for a little dimension, and salt to balance it all out. Throw it all together in the crockpot, cook on low for 8 hours (perfect for a work-night! ), and you will have something pretty delicious to look forward to! I used a 2-kg (4-ish lbs) pork shoulder, but it was bone-in. I’ve also made it with a smaller 1kg/2ish-lbs boneless pork shoulder, honestly, it all worked for me. You will save yourself some prep time by buying boneless, but the bone will also provide some extra flavor, so it’s your call. The bone is super easy to pick out after it’s all cooked up. 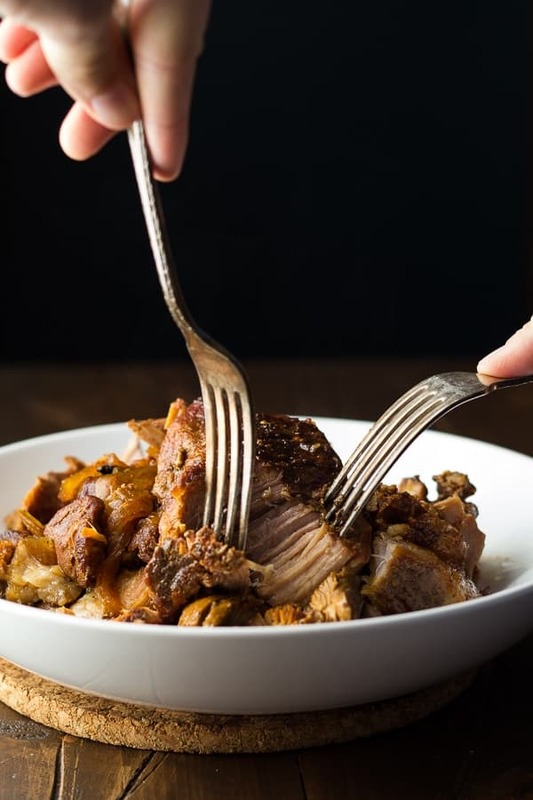 Once you have your maple pulled pork, what next? Well, you could serve it as is. Or, you could use one of the three recipes below! I will be posting the recipes for them throughout the week, so stay tuned! Cut pork shoulder in half, lengthwise. This can be tricky if it has the bone still in it, just do your best to cut around the bone. Trim excess fat if desired (I did). Place onion slices on the bottom of slow cooker. Place pork shoulder on top. Whisk together the maple syrup, apple cider vinegar, salt and chili powder. Cook on low for 8 hours, or until pork is fall-apart tender. Remove pork from slow cooker and place in a large bowl (reserve cooking liquid). Shred gently with two forks. Toss with cooking liquid to taste (I used at least half of the cooking liquid). 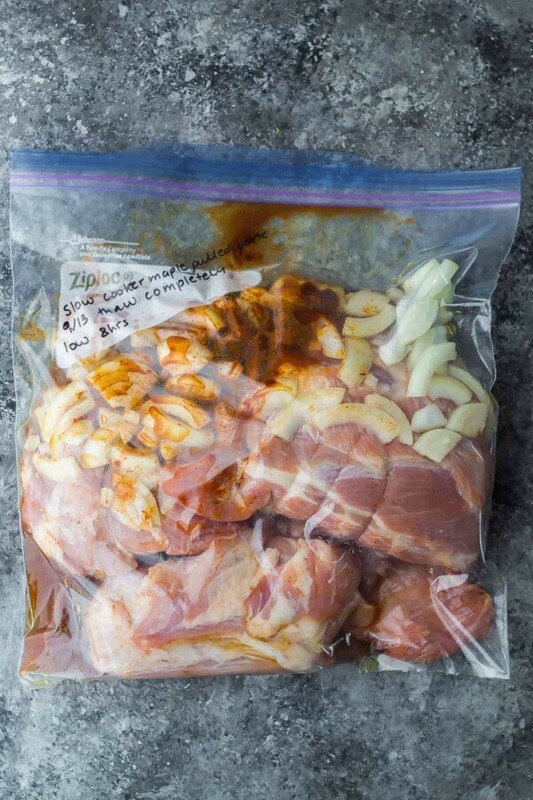 Combine all ingredients in a gallon-sized freezer bag. Remove as much air as possible. Freeze for up to 3 months. Thaw completely, then cook as directed above. Could you do this in the instant pot? What would be the cooking time? Hi! 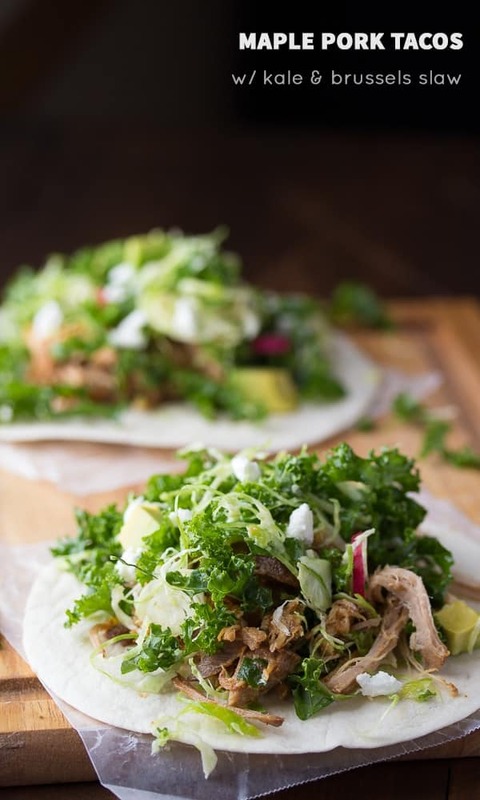 I’d love to make this for meal prep this week! I couldn’t find pork shoulder at the store and bought pork tenderloin. Should I change the cooking time? Thanks so much! Hi Missy! I see a lot of pork tenderloin recipes cook on low for 8 hours so I think you could do the same with this recipe. Good luck and I hope you enjoy the recipe! Hi Kelly, I have only tried with maple syrup…I’m not sure pancake syrup would work the same. Looking forward to making this! Here inAustralia, REAL maple syrup is hard to come by. Do you think I could sub honey? Perhaps using a bit less? Many thanks Denise! I didn’t appreciate the possibility of honey burning…thank you for the advice, much appreciated ? If I wanted to use chicken would you recommend breast or thighs? Hi Quay! You could use either…I haven’t tried it with this recipe but I’m sure they’d be good. You’ll want to reduce the cook time to 4 hours high or 6 hours low. Good luck! Can’t wait to try this! Is that really all the liquid you add… vinegar and syrup? Seems so little for cooking all day. Hi Tara! I know, it does seem like a small amount of liquid, but it works! I cut the pork in half lengthwise so it is mostly (if not completely) immersed in the cooking liquid. I have a 5 qt crockpot in case that’s not mentioned above. Oh Denise you`re brilliant!! I love your repurposing of leftovers. I have the same problem in our house to these recipes are perfect!! Hi! The maple pulled pork sounds great, but I didn’t find the recipe for the pork. I only saw the paragraph mentioning which ingredients that you used. Can you share the amounts of each ingredient? Thank you! Hi Robin, the recipe is right under after the burrito bowls photo. Scroll past the writing and the three photos for the left-overs, and it should be there. I hope you like it! I love the simplicity of this! I have the same feelings about pulled pork. Sometimes it’s way too saucy, taking away from the tender pork. I can’t wait to try this! I love making pulled pork in the slow cooker, so this sounds fantastic! 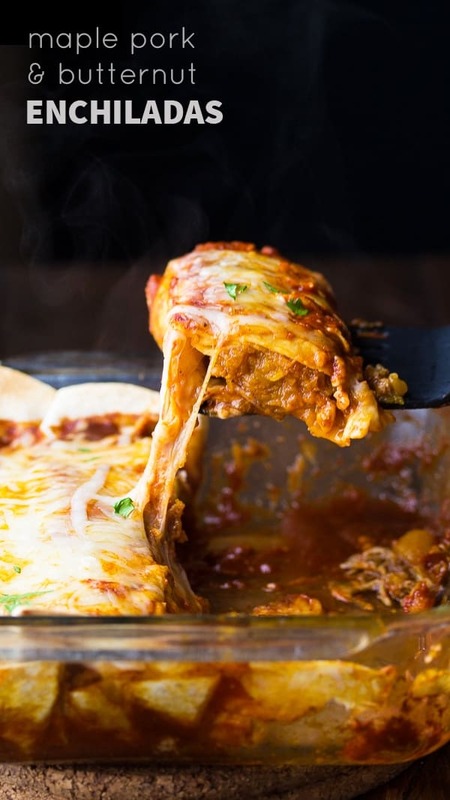 I’m loving the flavors and those enchiladas are just mouth watering! Thanks so much, Danielle! I am loving my slow cooker these days…so easy! Thanks for sharing this delicious recipes ! I love this!! I will have to use beef though coz we dont eat pork. I love these recipes! And the maple pork sounds amazing. Those enchiladas…. I’m pretty much dying here. Please come make me some! I will be there ASAP…ha ha! Thanks, Jess! I am definitely trying this one day! I am actually always a pulled pork lover (and a sauce lover, so maybe that’s why?) but maple?! Love! I could never put my finger on what was putting me off pulled pork but it definitely had something to do with the sauce…I’m a strange, picky lady 😉 Hope you like them, Ashley! Thanks so much, Catherine 🙂 Pulled pork in the slow cooker makes things SO easy! Recipes like this are gold. 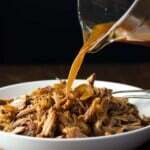 We love pulled pork, and I can’t wait to try your version with the maple syrup! Yum! This is such a great series, Denise. I love pulled pork, but don’t always want it slathered in BBQ sauce! I adore using maple syrup in cooking, so this sounds right up my alley. Can’t wait to see the other delicious recipes! Ah I’m glad I’m not alone! I like BBQ sauce in extreme moderation 🙂 Thanks, Marcie! I love your 3-ways recipes! This maple pulled pork sounds delicious. And so do the recipes that use them! I seriously want to make this right this minute so we can have it for supper tonight. Unfortunately the only pork I have is frozen solid, so maybe later this week! 🙂 I’m with you on pulled pork usually being too saucy, I don’t like that either. I definitely need to try this one! Wow. This pork sounds incredible. 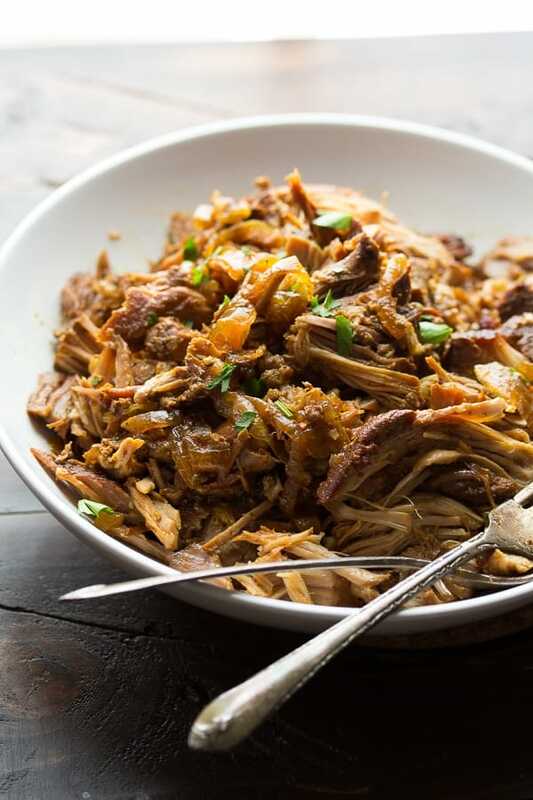 I have a soft spot for pulled pork and a slow cooker version is right up my alley. Love this! Pulled pork is such comfort food, isn’t it? Thanks, Jen! Thanks so much, Olivia 🙂 Maple and pork go really well together! Oh this pulled pork looks perfect, Denise! I’m kind of the opposite of you, I love pulled pork because of the amounts of sauce! But I’m especially loving that you flavored this with a maple sauce. Sounds perfect for the fall! Thanks so much, Gayle! I know I’m a bit strange, for some reason I can only handle a very small amount of BBQ sauce at a time!